For the best day of your life, Betty London has made a secret limited edition wedding collection! Whether you're pretty bohemian in a long dress, modern in a jumpsuit or pretty flirtatious in a short dress, the Call Me Madame collection by Betty London is for you. Audacious or romantic, the witnesses will also find the perfect outfit to shine on this happy day. Since childhood, or only for a few months, she obsesses us: the wedding dress! Short serrated sleeves and open back whith lace is the ultimate bohemian dress. Not interested in the long dress ? Betty London presents the smart, short and elegant dress. Open back and romantic lace, this one is perfect for you ! What if we dared to be different ? 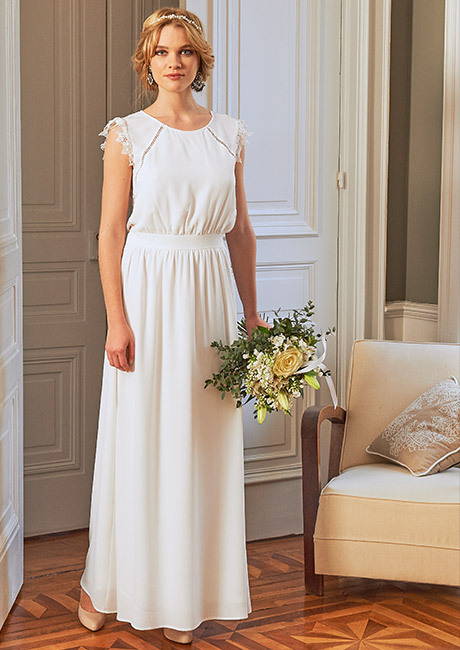 The unconventional bride will undoubtedly prefer the jumpsuit which is trendy, feminine and fashion at the same time.